Several days ago I came across an interesting thread at http://www.knittingparadise.com/ discussing this problem. The knitters suggested quite a few ways of calculating the length of yarn tail BEFORE starting to cast on. 1. The length of tail is 1 inch per 1 stitch. That is, if you need to cast on 50 stitches, the tail should be 50 inches. Should work fine for worsted weight yarn. 2. Another lady suggested to wind yarn loosely around needle so many times as the number of stitches you need, then to let the loops go - that's the tail. 3. Another way to estimate is to leave tail 3 times longer than finished knit. For example, if you cast on for a back of sweater 50 cm (20") wide, the tail should be 50x3=150 cm (20"x3=60"). 4. You can also cast on 10 stitches, then take them off and measure the length of tail you needed for 10 stitches. Then divide the length you measured by 10 and multiply by the number of stitches you need. 5. A quick way to estimate the length of yarn tail is to measure the length of your arm. One of the knitters participating in the discussion said that arm's length of yarn should be enough for casting on 30 stitches in worsted weight yarn. All these suggestions are very interesting and practical. From my experience, if you put tail yarn on your thumb and main yarn on your index finger, you will use less tail yarn than when you do the opposite and put tail yarn on your index finger and main yarn on your thumb. Either way you do it, I think the most precise way of calculating is the way #4. It probably takes more time to measure and do all calculations but you won't end up with a too long or too short tail. Just don't forget that you should have a 10-15 cm (4-6") tail left when you finish casing on. Add it to your calculations. e.g. If you need to cast on 50 stitches, the tail should be 50x1.1+15=70 cm long. I mostly work in sport and worsted weight yarn and this formula works just fine for me. The easiest way to calculate a long tail... is to use no tail! Instead of doubling up one length of yarn, just use TWO yarn sources (ie two skeins, or one skein using both ends). Treating the strands like one big strand, hold the yarns together and make a slip knot and place it on your needle. 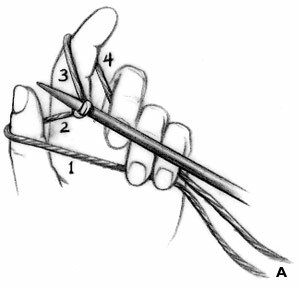 Separate the strands, one over your thumb and another over your finger, and get busy long tailing away. Don't worry about your big ugly slip knot - it isn't included in your stitch count. At some point, just undo it. When you have cast on all your stitches, just cut one of the strands - it doesn't matter which on. Get knitting with the other one, and never ever miscalculate your long tail ever again! Maryna, thank you for your posting of great solutions to a problem that has plagued me for years. And, happyhomeeconomist, your technique is INGENIOUS! Reading it, my jaw literally dropped and then I thought, "why didn't I think of that?!?!" I had the same reaction when, after 30 years of knitting, I first learned about lifelines. I cant thank you both enough. Brilliant. I'm going to try this right now with Aran weight yarn and 156 stitches! Wow. Best solutions EVER. Am going to use happyhomeeconomist's as soon as I get off the darned internet (!) Question, tho: um, duh, what's a 'lifeline'? ABSOLUTELY BRILLIANT. I'm starting a 223 stitch project which calls for long-tail cast-on and was dreading tryig to figure out how to calculate the yarn. Tried this out on some spare yarn and yoila! THANKS! I'm confused... if you just cut your slip knot off, won't your piece unravel??? Also, do you count the two stitches your slip knot makes when you start your cast on?